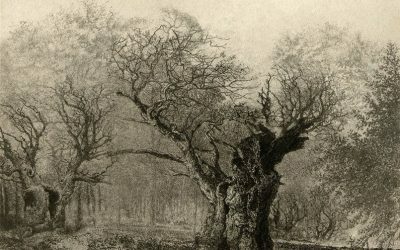 Woods, copses, forests have long inspired artists and writers. 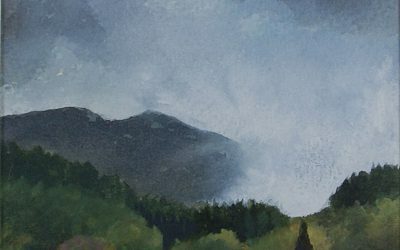 They can be unsettling or calming, used by writers and artists as a metaphor for the light versus the dark, good versus evil, the fantasy world as opposed to the real. These realms contain a wealth of ideas for the creative imagination. Such places affect individuals in different ways, from being places of peace and solitude to being claustrophobic and bringing out primordial fears. 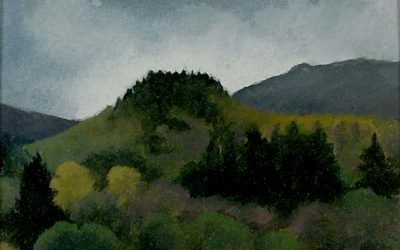 This small selection has been made to illustrate that woods and forests have been a subject for artists since the sixteenth century, and continue to be relevant to artists today. There is a much diversity in approach. 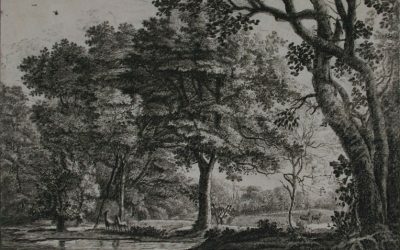 The earliest woodland scenes in this display come from the mid seventeenth century. 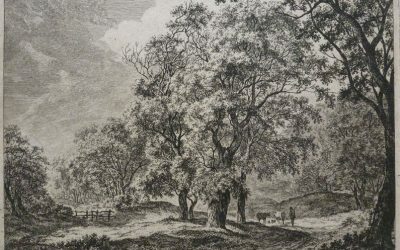 Landscape as an independent subject for artists was still relatively new at this period but reflects a growing awareness that people were beginning to have for their locality. Having a sense of your own place was as much about one’s sense of self as it was about nation. 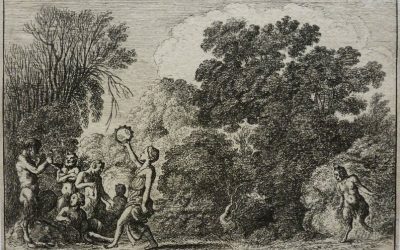 Landscape was more than just a background feature for mythological or biblical scenes though this custom continued for some time. Roelant Roghman’s Deer in the Hague Woods is from a set of six etchings that show the woods around The Hague, much enjoyed in recreational ways by the local citizens. The pastoral use of woods is seen in Frans Andreas Milatz’s Interior of Forest with Cows. 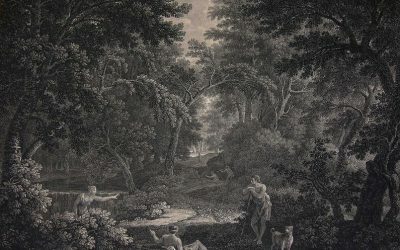 More formal Classical attitudes are found in Wenceslas Hollar’s Satyrs and Nymphs (from a picture by Adam Elsheimer), and William Woollett and John Browne’s Clearing in a Forest which is based on a painting by Gaspar Dughet. (Both Elsheimer and Dughet lived in Rome at a point in their careers and and worked in an Italianate/Classical style.) 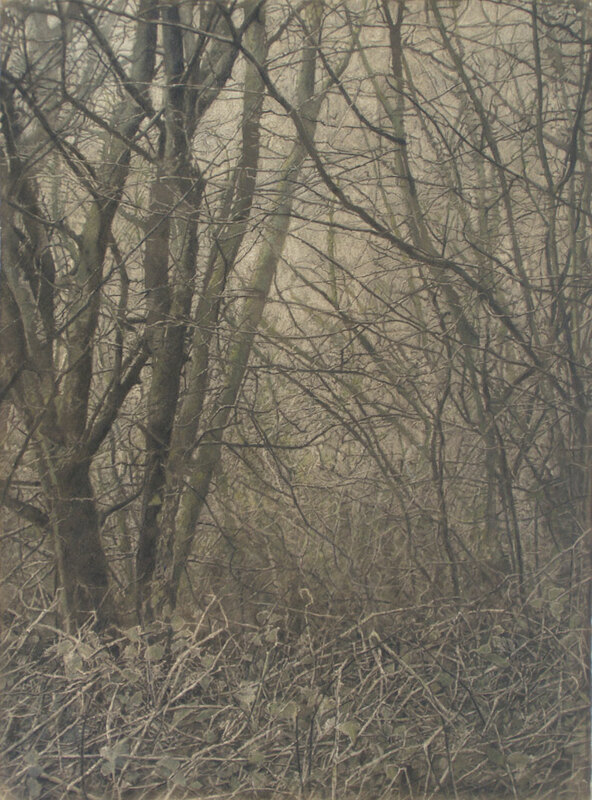 The etchings of the contemporary printmaker Jay Zhang complement this group of Old Master prints. 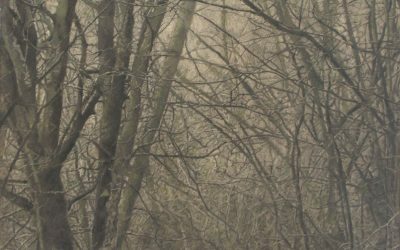 In contrast, a more abstract, conceptual approach is to be seen in Jack Milroy’s Into the Dark Forest II. 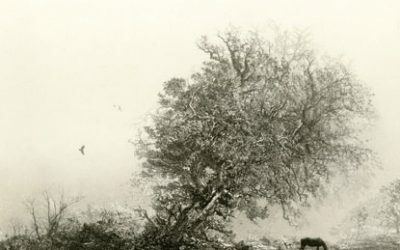 This image developed from a sculpture commission for the Goodwood Sculpture Park. 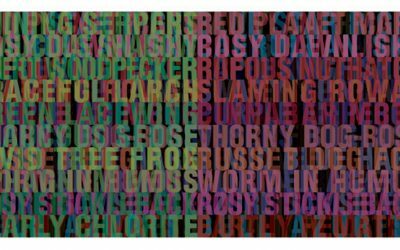 Intending an arrangement of ten layers of ten rows of words, creating a cube of text that described the flora and fauna found above, on and beneath the earth’s surface, Milroy spreads the content out in this extraordinary print. Assisted in the choice of words by the author A.S.Byatt the ten squares indicate, from light on left to dark on right the notion of the forest’s border to the darkness of its interior. The positioning of the names of the flora and fauna, the choice of colours and their relation to place in the ‘chart’ further extend the close examination of the forest as a whole. Fiona Hingston’s Wood No.2 actually uses the earth of the forest floor as its starting point. Covering the paper in soluble earth she works from the basis of dark to light, finely scraping away the earth and enhancing the image with colour crayon. The luminosity contained within the drawing is achieved through the careful removal of the dried soil which has stained the paper. 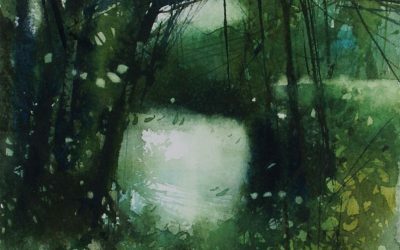 Jenny Graham’s Welsh forests are seen from above, the mountainous landscape tree covered., whereas David Parfitt’s woodland stream is a more intimate encounter. 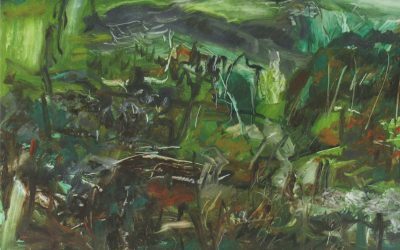 Ione Parkin’s abstracted painting expressively captures the wildness of an unkempt wood.